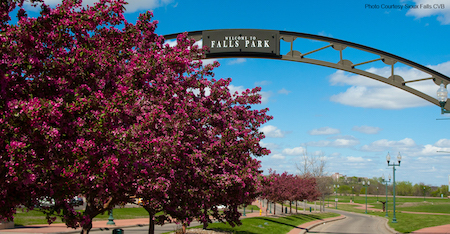 Kick off summer in downtown Sioux Falls! We have an exciting First Friday filled with art receptions, live music, food & drink specials and more signature DTSF events! Come downtown for this year’s first May Art & Wine Walk! A wide variety of artists and wine samples await, as you visit locations in downtown Sioux Falls from 5PM – 8PM. Viewing the art and meeting artists is free, and for just $20, you’ll receive a Sampling Punch Card with 10 samples. You can also purchase wine by the glass for $5. Punch cards available for purchase at any wine-serving location on May 3, 2018 from 5:00pm – 8:00pm. Extend your First Friday fun to Saturday for the first-ever May Eastbank Block Party presented by Vern Eide Honda! Enjoy live music, food vendors, beer, wine, and shopping at some of the most unique stores along the boardwalk of the 8th & Railroad Center. You’ll also have a chance to win a 2-year lease on a 2019 Honda Passport from Vern Eide Honda with the 2nd Annual Hops & Honda Tour Kickoff. Art & Wine Walk – Jamie Jacobsen at Rehfeld’s: Rehfeld’s Art & Framing is one of the stops on the Art & Wine Walk that you will not want to miss. Stop by to view the oil and watercolor work by one of our newest artists that will be featured in the center of the gallery for the month of May and will remain in the gallery going forward. 5PM – 8PM, 210 South Phillips Avenue. Art Reception: Karissa Meyer & Joseph Keating at Museum of Visual Materials: Come to the Main Gallery for the paintings of Karissa Meyer and in the Faithe Gallery for Joseph Keating’s artwork. Light snacks & cash wine bar available. 6PM – 8PM, 500 North Main Avenue. Chris D’Elia – Follow The Leader Tour at Sioux Falls Orpheum Theater Center: Comedian at the historic Sioux Falls Orpheum Theater. 7PM – 9PM, 315 North Phillips Avenue. Cursive w/ The Appleseed Cast LIVE at ICON: Come watch this live concert with local bands Roman Ships and Lost Harbor. 8PM – 12AM, 402 North Main Avenue. Dayna Jones Music at Woodgrain Brewing Co.: Enjoy live music and craft beer on First Friday. 6PM – 9PM, 101 South Phillips Avenue Suite 100. Disney’s The Lion King Jr at Washington Pavilion: The Dakota Academy of Performing Arts and through special arrangement with Music Theatre International presents: Disney’s the Lion King Jr. 7PM – 8:30PM, 301 South Main Avenue. First Friday Fiesta | Sioux Falls, SD: Enjoy the outdoors by strolling over to Pigott & Jane Rae Events storefronts for a free Open House! Both locations specialize in the design field & would love to show off their services & showrooms to you. Grab a margarita, chips, & queso on them. Live music will pull you into the lot & the open garage doors will welcome you with open arms. 4:30PM – 7PM, 301 South Minnesota Avenue. It Takes Two – Amy Jarding & Cameron Stalheim at Vishnu Bunny Tattoo: May’s show brings out finer things club of sorts. It Takes Two features the work of Amy Jarding and Cameron Stalheim. All ages welcome and features the return of DJ Big Papa and live music by newcomers Central City. 7PM – 11PM, 202 South Phillips Avenue. Live Music by Devon Cadwell on the Patio: Its time for outdoor music! He is a master of gigging and loves playing long sets of original music with a mix of covers. 7PM – 10PM, 421 North Phillips Avenue Suite 101. May First Friday at Myers’ Deli with Holly VandenBerg on patio! : Enjoy food and drinks on the patio with a fun setlist of live piano music for all to enjoy! 6PM – 9PM, 221 South Phillips Avenue. The Abrams at Washington Pavilion: As fourth-generation musicians, The Abrams have been taking their American/Country sound on worldwide tours for over sixteen years, and they are among the youngest performers to ever play the world-famous Grand Ole Opry in Nashville. 7PM – 8:30PM, 301 South Main Avenue. The Cookie Jar Eatery Caramel Rolls: Caramel rolls $5.00 off per dozen. MUST PRE-ORDER 48 Hours in advance to receive special pricing! 7:30am – 3PM, 230 South Phillips Avenue Suite 101. Wine with Jurek Jakowicz at Bechtold Jewelry: Meet Jurek and see some of his sculpture and portrait work on display all while enjoying some wine and snacks! 5PM – 8PM, 325 South Phillips Avenue. Wusthof Classic Sale at Plum’s Cooking Company: The first ever Wusthof Classic Sale starts and makes perfect gifts for upcoming weddings, Mother’s Day or Father’s Day. Wusthof has never had everything in the Classic line on sale before, so be sure to grab knives for everyone on your list this spring! 10AM – 6PM, 401 East 8th Street Suite 107. Check back for updated and added events!